THE PARK EMPLOYS 20 QUALIFIED AND EXPERIENCED PARK GUIDES THAT CAN BE BOOKED DIRECTLY AT THE PARK HQ. Prospective visitors that are physically challenged in any way, must please enquire via email pertaining the activities at Mulu National Park before finalizing their plans/bookings. 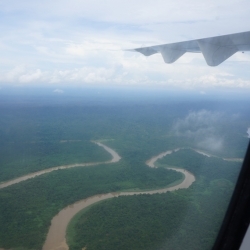 This remote wilderness area can realistically only be reached by flight. 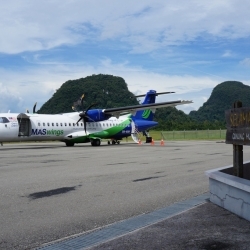 Maswings, a subsidiary of Malaysian Airlines, offers daily flights to Mulu from Miri, Kuching and Kota Kinabalu. Kuala Lumpur is the main entry hub into Malaysia. From there you fly to the island of Borneo to one of the above mentioned ports. Please allow for a flexible itinerary and flights to and especially from Mulu. Heavy rainfall may occasionally result in flight cancellations. Allow sufficient time to catch connecting flights and pre-booked activities. Daily flights from Miri (30 minutes), Kuching (1 hour 20 minutes) & Kota Kinabalu (55 minutes). Subject to changes. Please visit MasWings / Malaysia Airlines for the current scheduling. All tourists entering the National Park must purchase a 5 day Pass. This provides unlimited entry for the period. Tickets are non-transferable. Visiting or staying in the park for less than 5 days does not alter this fee. 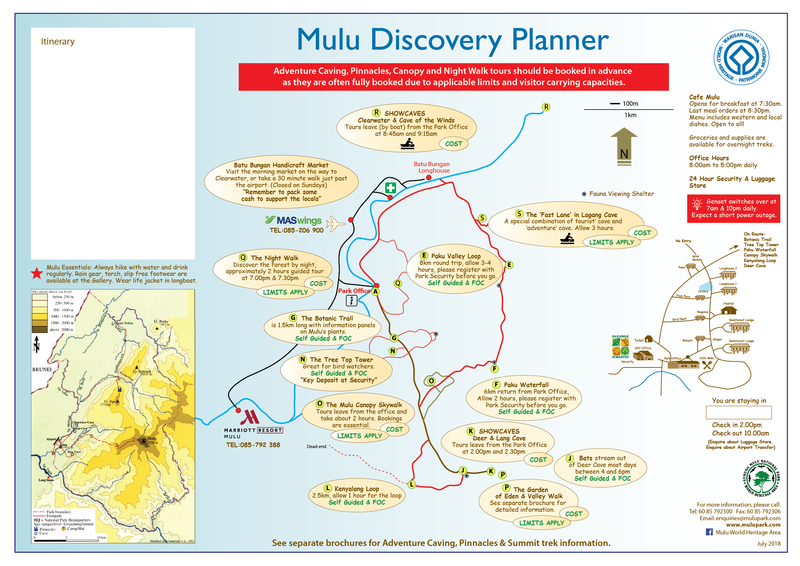 If your stay in Mulu World Heritage Area will be longer than 5 calendar days you are required to buy a second Park Entry ticket. Please note these fees are for park entry only, additional fee for Tours & Activities still apply. Malaysian citizens must present their Identity Card as proof of citizenship. 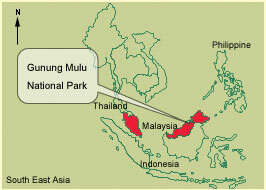 Mulu can be visited all year round. Of course, being in a tropical rainforest please expect frequent cooling rains which brings the magic of the Rainforest to life. 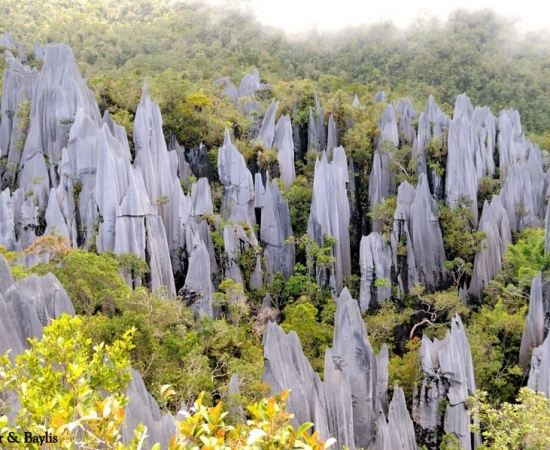 Each Mulu morning usually dawns with a clear sky and a temperature around 23 degrees. By early afternoon the temperature has risen to about 34 degrees and 60% humidity; around 13:00 – 17:00 it will start raining and the humidity increases to 90%. Showers may last 30 – 60 minutes, but after the rain the air is cool and fresh, the evenings are usually fine. Please allow for a flexible itinerary and flights,to and especially from Mulu. The Mulu weather is completely unpredictable and has a major influence over flights into and out of Mulu. Allow sufficient time to make deadlines for important connecting flights or pre-booked activities, that are non-refundable or coupled to expiry dates. June, July, August, September and holiday periods are usually busier than other times of the year. We recommend that at all times you should make bookings for accommodation and guides in advance to avoid disappointment. Once the facilities are full and the guides booked then there is nothing we can do to help even though you have traveled a long way to visit. That means: NO banks, NO chemist, NO shopping centres! Light clothing for tropical weather, a very light shawl or jacket for the evenings. If you do overnight treks you will need enough changes of very light clothing because of excessive sweating. Your clothes might also not get dry overnight. 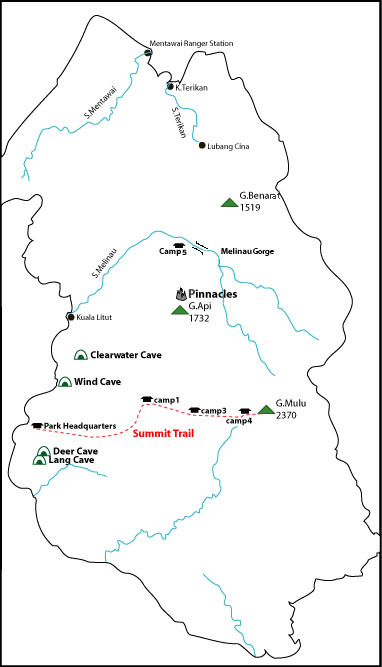 Only at Mulu summit will you need a warmer jacket and sleeping bag. Bedding for Camp 5 can be obtained from HQ for a refundable deposit. Mosquito nets can be rented at HQ. You may find some answer from our Trip Advisor review.